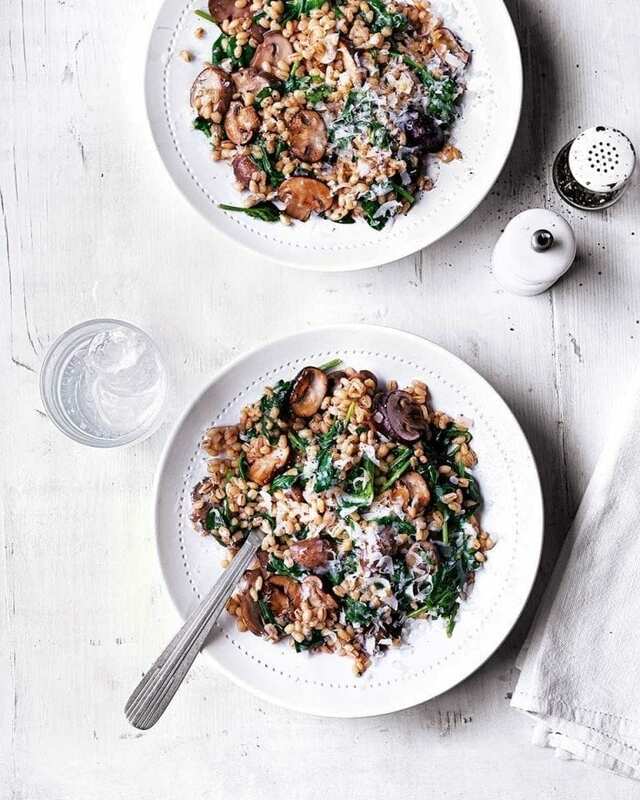 This vegetarian risotto recipe is made with pearl barley as opposed to rice. The fibre keeps you feeling fuller for longer and there is no compromise in taste. Heat the oil in a heavy-based pan, then fry the shallots for 6-7 minutes until soft. Add the garlic, thyme and mushrooms, then fry for 5 minutes more. Add the pearl barley and stir for a minute. Pour in the wine and bubble for 5 minutes or until mostly reduced. Add the hot stock and bubble gently for 45-50 minutes, stirring occasionally, until the stock has been absorbed. Add the spinach and parmesan, stirring until the spinach has wilted (about 5 minutes). Season, then serve with extra parmesan grated over the top. Swap thyme for sage and fry a few extra leaves in butter until crisp to garnish. This was delicious! Should have given 5 stars but rating had set before I could change it.